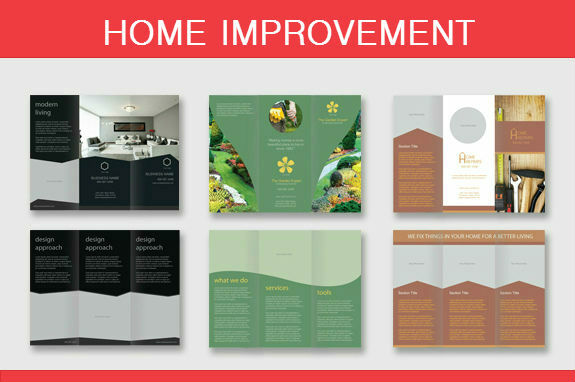 Brochures are practical marketing tools used to promote your information-heavy campaigns. They can be laid out like a take-out menu and contain listings of different products and services; or function as travel and events guides. 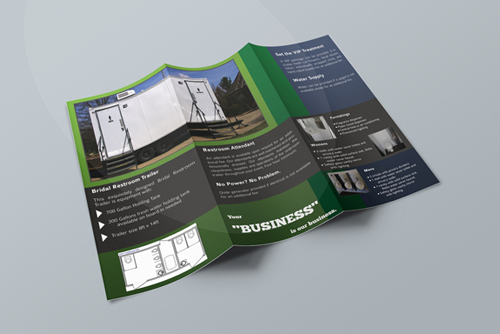 Brochures come in standard and custom sizes. Read on to learn how to standard brochures that will work best for your business. 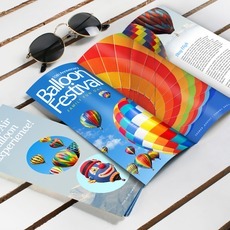 The amount of information that you will include determines the brochure size suited for your business. 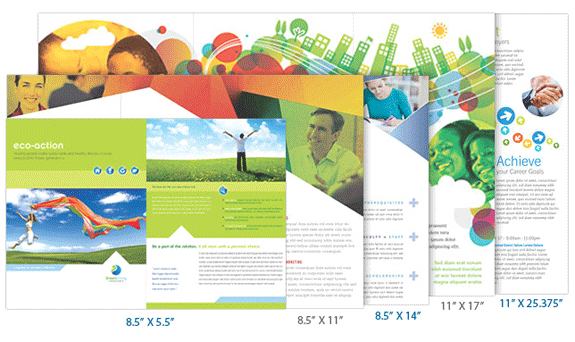 There are five standard brochure sizes — which you can combine with five popular types of paper folds. It helps to create an outline of your content to h ave an idea of the size that best work with your material. 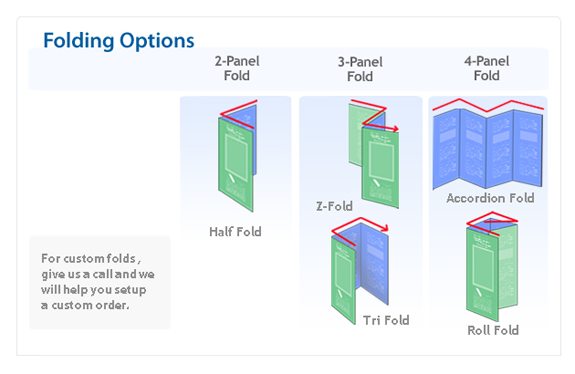 The final folded size of your brochure depends on the combination of: flat paper size, fold, and orientation (horizontal or vertical). 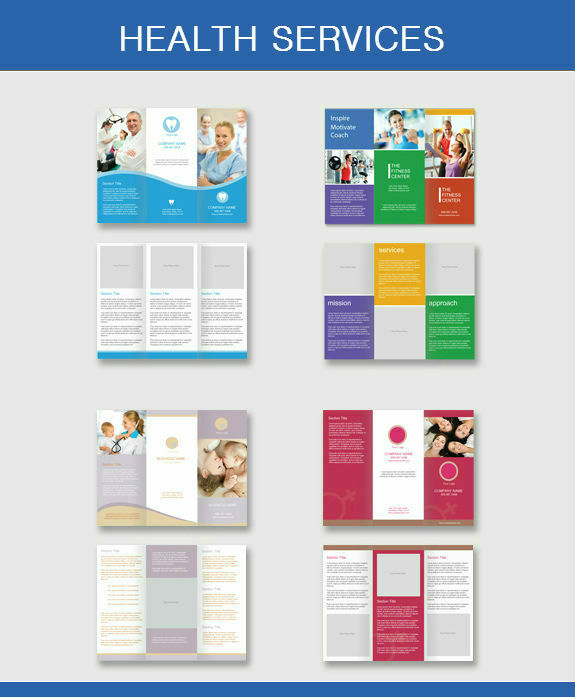 We have blank brochure templates for standard brochures that you can download to guide you in creating a layout — or you can download the templates below, designed for industries that commonly use standard tri-fold brochures. Disclaimer: Images used on the brochures are samples – you can edit and use your own photos using the placeholders on the templates. Enjoy making your own brochures! Services - A good example of this would be photography studios. 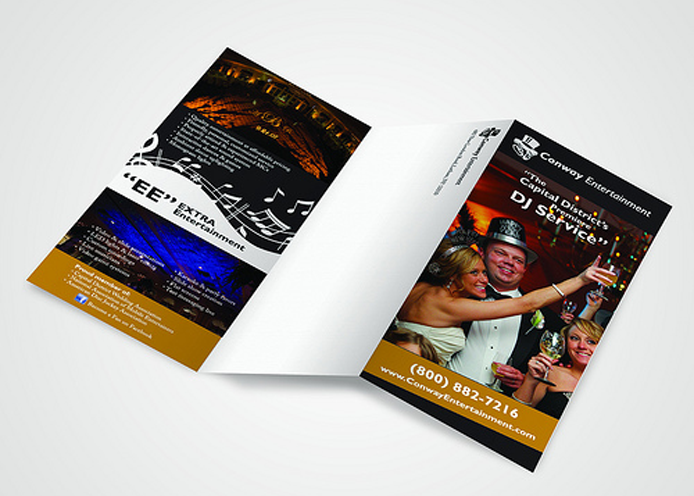 These brochures can feature sample works, special packages and contact numbers. Medical - informative guides that give summaries of health care facts, medical conditions, health concerns and general first aid topics. Trade Fair - participating companies in these events have an opportunity to communicate with their audience through brochures. They can showcase and demonstrate their products and services and position their brand among competitors. 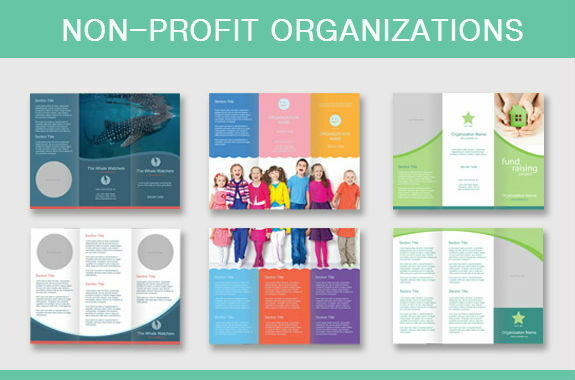 Non-Profit Orgs - these orgs use brochures to explain advocacy, history and mission to gain support from potential benefactors and general public. On the other hand, the larger brochure sizes; 11” x 17 and 11” x 25.375 are more appropriate if you want to have more detailed content because some businesses would require image-heavy content. Amusement/Theme Park Brochures - a definite need for theme parks to have because this informs people of featured attractions, rides and other events. Mini maps - map representations are especially helpful for tourists to guide them throughout their trip. Ideally, mini-map brochures contain the street names and popular landmarks. These are displayed on hotel counters and souvenir shops. A more detailed map may need custom sizing and options. Choose easy to read fonts (i.e., Garamond, Helvetica, Times New Roman, or Century). Use a sans serif font, such as Arial, for captions or small type. Limit your font choices. Using more than two types of fonts will make your brochure messy, unprofessional or playful. Use highlighting techniques – bold, italic and bigger font size — instead of varying font styles. Use a bigger text size for headlines and calls to action. Although not always, font size can be relevant to the importance of information. Choose font sizes that are proportionate to the size of your brochures. To help you decide on the font size, assess how many words you want to fill the space with. Use 12-point font for the body, 10-point font for captions, and 14- to 22-point font for headlines. These are recommended sizes, but your choices will depend on the overall look of your design. Avoid putting borders on your paragraphs, unless needed. Break long paragraphs into bullet points. Walls of text can discourage people to read further and bulleted information is easier to recall. Use proper typographic alignment (flush left, flush right, justified, and centered) for a neat layout. Align design elements — headers, images and text —properly. Make spacing consistent throughout your design. Remember to leave some white space on your layout to give your content a balanced look. This helps make your design easier to read. It helps to ask opinion from a friend on your font legibility and overall design before having it printed. If you need sizes other than the standard options, UPrinting offers custom brochures up to 11” x 17” for digitally printed runs and 27” x 39” for offset jobs. All you have to do is to fit in your content, images included and we will make sure your design is print-ready with our free proofing service. For more information on brochure printing, call us at 1-888-888-4211 or chat with our friendly representatives. Our lines are open 24hours from Monday to Friday and from 8am to 9pm on weekends and holidays.